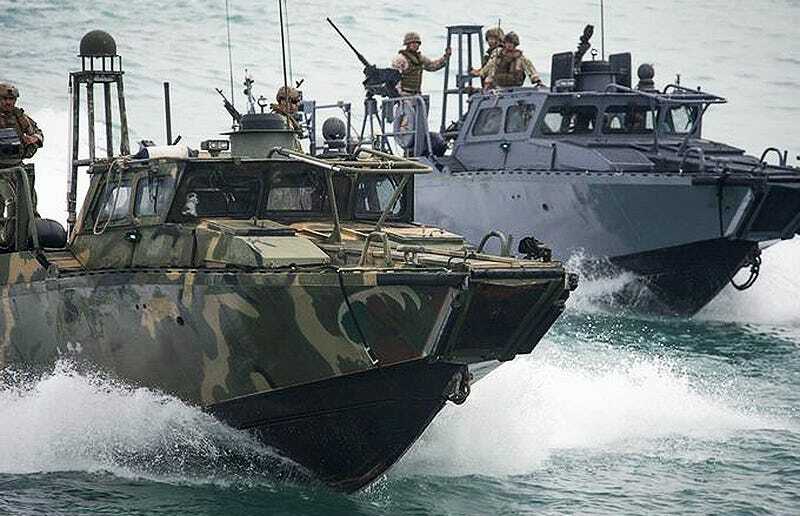 Details remain scarce, but news reports say Iran has detained two U.S. Navy small boats and 10 American sailors that were operating near Farsi Island in the Persian Gulf. The boats were moving between Kuwait and Bahrain when the boats supposedly experienced mechanical problems and began drifing toward the Iranian-held island. As a result they were taken into custody by the Iranian Revolutionary Guard. The Navy says the boats were on training mission and we do not know the exact type of craft involved, although a variety of U.S. Navy small boats are used in Persian Gulf. These include the Small Unit Riverine Craft pictured below and Riverine Command Boats shown at the top of this post as well as others. This comes shortly after Iran fired rockets near an American supercarrier transiting the Straits of Hormuz and just hours before the President’s State of The Union Address as well as the final implementation of the Iran nuclear deal. UPDATE: 3:03PM PST- CNN Pentagon corespondent Barbara Star reports that nine male sailors and one female sailor are being held and they will not be released until morning. UPDATE: 3:12PM PST- Foxtrot Alpha has heard and CNN reports that the boats may have been supposed to be refueled in the proximity of the island by a larger craft. If this report is true, and the vessel never showed up, this could explain how both boats became incapacitated. UPDATE: 4:47PM PST- CNN.com reports that there has been voice communications between the sailors Iran detained and the U.S. Navy and that there will be a hand-off of the crews in international waters in the morning. It is unclear if the U.S. Navy boats involved will also be handed at that time. CNN.com has also reported the same scenario that we outlined above, that the boats were near the island for a refueling event. It remains unclear if that event took place or not and if it was related to the incident or not. Split statements between the Iranian government and the IRGC are not unheard of and the sailors could still be returned very soon. Still, it shows the prospective of the IRGC on the matter. UPDATE: 12:35AM PST- Iran has apparently demanded an apology for the U.S. Navy boats entering into their territorial waters, which they say they have gotten. Meanwhile, some reports state that at least one governmental source in Iran states that the boats’ navigational equipment malfunctioned. UPDATE: 2:18AM PST- Iran says they have released the sailors and FARS News has posted pictures of them seemingly in good condition. There has been no confirmation of this yet by U.S. officials. UPDATE: 2:40AM PST- CNN reports that U.S. officials have confirmed that all ten sailors and their boats have been returned to the U.S. Navy cruiser USS Anzio (CG-68) in international waters. Tweets coming out of Iran also show that the boats involved were in fact Riverine Command Boats.